When I travel on planes I am always more hungry. I can’t decide if it is boredom or actual hunger, but I always eat more when traveling. I saved my snack to have on the plane for this very reason. Am I alone in this? 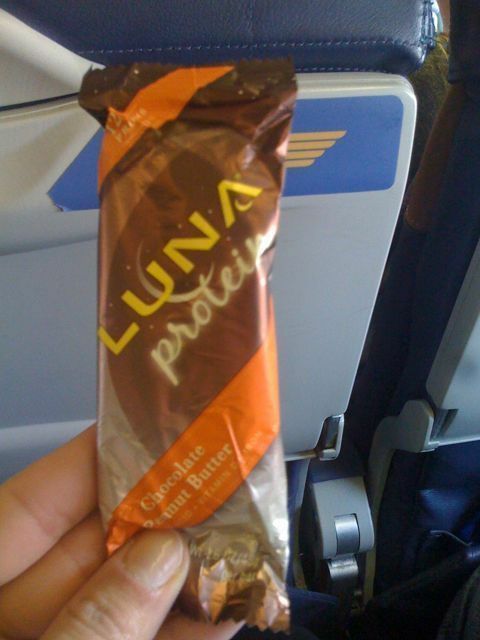 On our flight from Philadelphia to Denver I had a small container of pistachios I had purchased in the airport as well as a Luna Protein Bar in the chocolate peanut butter flavor. I really like these bars although I wouldn’t call them protein bars necessarily- they don’t contain that much protein. 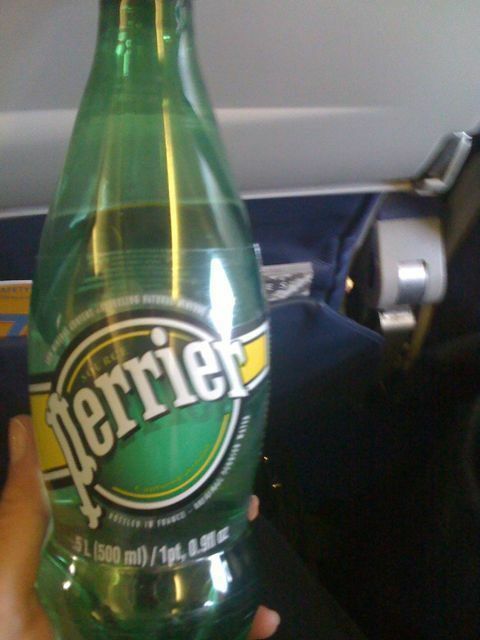 I also had some sparkling water, one of my favorite beverages. Dottie, from Food Cents, lives in Colorado and sent me some tips for our trip. One tip she gave us was the address for a Whole Foods right off of Route 70, right on out way to Beaver Creek. That tip saved us! We hopped in our rental and headed straight there to eat dinner and grab some groceries for our room. We all made big salads from the salad bar. Mine had mixed greens, romaine lettuce, artichoke hearts, roasted chicken, a few peas, dried cherries, shredded carrots, 2 delicious tortilla chips and some balsamic dressing. This was delicious and perfectly satisfying. A lot of time in these situations we end up eating junk that doesn’t even taste good. I am happy we had a nice healthy dinner. As soon as we got back in the car I shared one of my mini muffins with Gina (see yesterday’s post for details). I then had my own whole one!! I now feel great- not full and not hungry either. This is the ideal way I’d like to feel after every meal. This morning I woke up early but not early enough and had to choose between doing my hair and having it look nice tonight and tomorrow or going for my run. I chose my hair, how vain! I actually happy though because my legs are super sore from my strength workout and run yesterday. PB is driving and Jake, Gina’s husband, is the navigator. That means Gina and I can nap in the back. Buona notte! I always want to when I’m flying too. Actually whenever I’m traveling. It’s sort of annoying because not only do I want to eat but I want JUNK! For me I think it’s boredom and a childhood association of eating junk in the car on long road trips. Oh, I am the same way with eating while traveling! 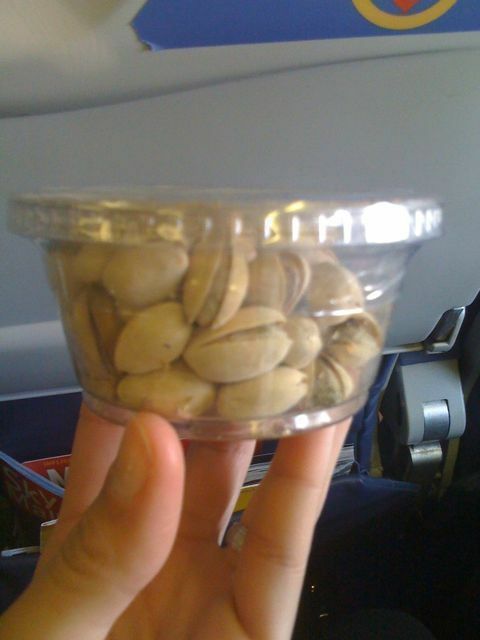 Maybe it’s because everyone eats those airplane snacks around us and we feel “trapped” on the plane?! I always want junk food for some reason, too! Good job on keeping it healthy! 20 grams protein, 15 grams fiber, no sugar, no sugar alcohols, no syrups…. Just healthy goodness. Hey, first time commentor haha. LOVE whole foods hot bar too. It’s about the best “fast” food ever! i am always considerably more hungry on airplanes and on road trips. i attribute part of that due to drinking less, especially when im in the car since i cant have frequent potty breaks or we would never make it to our destination! Thanks for stopping by Sesame Seed! I have hard so many lovely things about you and your blog- I love it! 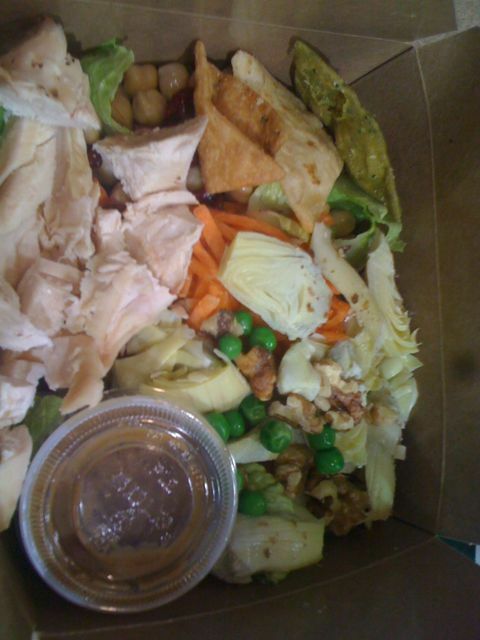 Great lunch at Whole Foods- my husband works there (Heather’s brother) so I often make a fun salad to go! I live in Denver and often shop at the Whole Foods off 70. Small world!! @Tori, Small world for sure! I love how incredibly nice everyone was. They were SO helpful even though it was closing time. What’s up colleagues, its wonderful piece of writing on the topic of teachingand entirely defined, keep it up all the time.